Posted by randydeutsch in architect, architect types, career, change, education, employment, IDP, pragmatism. What architects don’t get from architectural education has to be made up in practice. That’s certainly the intention of Intern Development Program (IDP), the comprehensive training program created to ensure that interns in the architecture profession gain the knowledge and skills required for the independent practice of architecture. Is the office the best place to train to become an architect? In firms, these days, almost everybody draws. And everyone is as close to 100% billable as humanly possible. No more can architects consider themselves “knowledge workers,” unless that knowledge includes working knowledge of such software programs as AutoCAD or Revit. With many architecture firms pared down to skeleton staffs, training is a luxury few can afford. And teaching recent grads on a client’s dime is something most clients will no longer tolerate. Building clients have never warmed to the idea that they are footing the bill for an intern’s education on the job. Tell that to any firm that has set-up and administered a corporate university. Neither academia nor practice, we’re beginning to see emerging entities that are starting to fill-in the gap, gaping hole or (for those attending Cornell) gorge between architectural education and practice. Enroll in the equivalent of a four-year lunch-and-learn. Don’t pass go don’t collect 200 dollars go straight to jail. At the same time, we’re seeing bridge students who take-up architecture and engineering; or engineering and construction management; or architecture and an MBA, to help segue between academic and real-world pursuits while presumably making themselves more attractive to an employer. Perhaps it is best that training – whether in continuing education or in practice – stay outside academe’s ivy walls. Training is still seen by some as parochial, vocational. In some academic circles “practice” is a dirty word. Why sully your pristine education with practical consideration? Some architecture schools won’t have practitioners on their faculty so as not to infect their student body, as though practical considerations were a disease. This, despite the fact that practical knowledge is a job requirement on the road to becoming a full-fledge professional, every bit as much as residency is for a doctor. Before building-up $150,000 in student loans, would-be architects – in most states – know that they will have to pass through an apprenticeship prior to sitting for the licensing exam. Remind me: What exactly did you get for your $150,000 education? Architects like to think that they are alone in many things, not the least of which is their inadequate education and training in the face of a constantly moving picture of practice. They are of course wrong: they have plenty of company. This is evident in the many parallels with other areas of study. They sound remarkably – and uncomfortably – close to what architecture students go through. 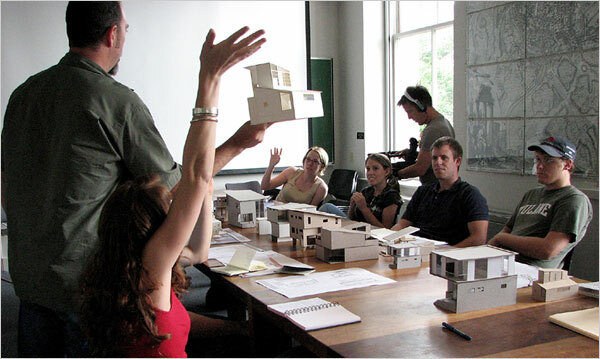 What is one thing you wish recent graduates, interns or emerging professionals were taught in architecture school? How ’bout one of each? A better understanding of the concept that they don’t yet know how to practice architecture, all they know is how to design, and that although design is a very important part of the practice of architecture, it’s just one part. Greater familiarity with the materials actually used in the construction of building envelopes. Deeper knowledge of their own lack of knowledge. Basic skills, like how to perform spell check. A stronger grasp of the concept that the technical stuff (construction documents, details, specifications, understanding of building technology) is ESSENTIAL to getting a building built, and that their role as interns is to ABSORB that information from the architects they work with. Thanks Liz for your abundant answers! Especially like the self-awareness theme: “Deeper knowledge of their own lack of knowledge.” Great stuff! Fantastic post, Randy! You’ve summed up our collective dilemma very well and painted an accurate picture of the vast chasm between an architectural education and actual practice. Most businesses of all kinds end up having to train new staff on how their firm or business does things. The difference is that newly hired employees arrive having at least a minimum level of competence and can begin contributing to the team fairly quickly. You asked: “What is one thing you wish recent graduates, interns or emerging professionals were taught in architecture school? That’s a good question. From my personal experience, I can tell you that the first day of my second internship- working for a medium-sized firm doing public works projects such as K-12 schools, post offices, and other state facilities- I literally felt like a fish out of water. Not sure if it was due to the firm’s buttoned up culture or my lack of proper training at school, but at times I felt stymied. I felt very lacking in my ability to perform the job. I literally had no clue how a firm was managed, what did an architect actually do all day, how to start a project (or even where did projects come from? ), or what details to draw and how to accurately draw them. I was thankful for the instruction of the PMs! Despite this nagging insecurity, the bosses were pleased with my work, noted how organized I was, and gave me raises and bonuses. Yet, I was unhappy with my lack of progress and, being competitive in that I wanted to be trusted with more work and not “spoon-fed” pre-drawn details for me to draft with perfection without being given the “big picture” of the project, I interviewed with a smaller firm, hoping to get more opportunity to test my skills. I was offered the job. However, I decided not to take it because of self-doubt– fear of what I didn’t know. So, from my experience, I would have liked my school to have taught me a better understanding of how an architect’s office is run, what technical books they refer to on a daily basis and how to access the necessary information (or the fact the The Architect’s Handbook of Professional Practice even exists!, how to manage a project, and how to be more than minimally competent on day one of my IDP internship. Regarding today’s emerging architects, from my distant view, they seem to be much more confident and knowledgeable than I was at their age. I have no idea what today’s graduates are being taught. As you aluded, it seems that the only thing that matters in most firms these days is if someone knows how to produce drawings in AutoCAD or Revit and that they be LEED GA or AP accredited. The PMs are the only ones expected to know how to run a project, communicate with the client, conduct code research, or prepare a set of drawings for permit. The question remains: how does one move successfully from being a graduate of theory to a practicing, competent architect? The way I learned was by self-study. And, of course, this is an on-going process. Essentially, I learned about how to be an architect by studying for the A.R.E. Nothing else prepared me for real practice other than that and working on residential projects that enabled me to see the big picture from start to finish. This learning continues with my self-commitment to continuous study of pertinent topics, independent research, and reading many, many books. One other thing I wanted to mention: In school, grades for design studios are rated 3x more then construction classes. I think this sends the message to students that “hey, construction is no big deal (or is the responsibility of the structural engineer)- or, don’t worry about all that dreary stuff now, you will be taught that on the job.” This last part is a big lie. You will NOT be taught that on the job. You will be thrown to the sharks and it is up to you to figure it out. Randy’s post: 801 words. Tara’s comment: 770 words. Thanks Tara for reading, enjoying and completely grasping this important subject. Thank you as well for sharing some of your experiences and for helping to put this discussion into perspective. To your last point: I wholeheartedly agree that even when emerging professionals are given the tools to learn whether through on-the-job, out-of-house or supplemental training, they are often left by upper management to sink or swim. Those who can tread water or better yet, swim safely to shore are often promoted: while the others are left to languish. This speaks to the importance of learning how to learn, so that me might teach oursleves how to keep-up in this constantly changing profession. Summer Internships. I did summer internships every year during my Architectural Degree “Career”. It helped me keep my college life in perspective, I knew what I was aiming towards. A role as an architect, and more specifically a project manager and not a designer role. The great thing about arch degrees is they allow flexibility for those extra classes, and I decided to take mostly business and Construction classes. My colleagues meanwhile took art classes and bowling, and started looking for their first actual work experience their 5th year, aka a Starting IDP intern position (this job hunt started spring on a June Graduation deadline). I would estimate approx. 50% had never had internships. Meanwhile I was interviewing with firms 8 months before graduation, starting in October, and decided that Architecture was no longer in my career goals. I decided to aim for construction, a more profitable, yet rewarding in the same ways I liked architecture (big projects, collaborative teams, managerial activities). After interviewing with 25 companies and 8 months I had two construction job offers, and two architecture job offers. One architecture firm I actually liked, and they had a huge role for me to play on a hundred million dollar job. It was hard to turn this one down, but I had made up my mind. The other was a 10$/hr offer in a design firm because I knew Revit. (I laughed at that one). And here I am at a construction firm, with an awesome role, touching lots of projects and working with great people. Where are my college associates? Still hunting for jobs or working as a “trial intern”, basically a poorly paid gruntworker who is lucky to have the opportunity. The point? College makes people prone to trust that the professor knows best. They are stuck permanently in their own perspective and that perspective probably won’t help you in your career, but will make you feel secure at the time. Knowing what else was out there in professional internships taught me the skills that were desirable in the real world, but more importantly taught me to set goals professionally and to be realistic about the process, instead of waiting till graduation to see what the real world is like.. Thanks Nathan for chiming-in here and sharing your story: should be a great inspiration – and point of reference – for many. The fact that you were interviewing in October proves how proactive you were about the process. Whether due to heavy workload or inertia, in my experience, most students don’t start sending out resumes until march or even April. To your point about professional internships: I might also add public-interest architectural internships as a great place to gain experience while doing some good and, in many cases, earn important IDP bucks. I’ll be reviewing this book soon, but I cannot recommend enough the book Bridging the Gap. I can see this is going to take more than a cursory read – I’ll have to come back so I can digest more. Nice pun about the gorgeous at Cornell. You’ve been to Ithaca I take it? Never been to Cornell but the two things I remember about (from friends who went to school there) it is that 1. it doesn’t rain, it “Ithacades” and 2. its gorges are gorgeous. Wow, I have to add my two cents to this great discussion. I earned my architectural degree from IIT in 1968. I grew up in a small town in Wisconsin so the Chicago experience, and being in Mies van der Rohe’s glorious Crown Hall every day for five years had a powerful effect on the young, impressionable me. I felt then, and still feel now, that although what IIT taught me in five years was valuable, it could have been covered very well in half the time. They should have spent the other 2-1/2 years exposing us to the equally fascinating practical stuff. A better understanding of moisture management, vapor drives, and implications for detailing building exterior envelopes. Greater familiarity with the business of construction contracting, and the incentives and disincentives facing building contractors. Deeper knowledge of mechanical, electrical, plumbing, and fire protection systems. Current students now should be taught about technology systems. Basic skills, like how to perform a code search. A stronger grasp of civil and site engineering considerations. I don’t know whether architectural schools have gotten better since the sixties. I sure hope they have, because you’re right that architectural firms are much less willing, and financially able for that matter, to help young practitioners build their skills. Namely this: Mentoring and giving back to the profession. I say that because you have done just that by leaving your wonderful comment here. And where else could you have learned to do that? Thank you for sharing your insights with us and adding to this fascinating discussion! Apologies in advance tor having a case of the keyboard runs. As someone who both educates and hires future designers, I think we are losing sight of a critical fact. This stuff takes a long time to master. The reason that we have internships (which used to be called apprenticeships) is because people knew a long time ago that you can only learn so much from an academic setting about what we do. Then you have to go out and do it, for a long time, before you get any good at it. I don’t think we are ever going to short cut that. It comes from having to be the people that have to deal with the general and the specific in a way that few other occupations do. I don’t think we can ever get away from the idea that firms are responsible for training the next generation. Most of what we do you can only learn on the job, really. Even if we crafted a curriculum that crammed every iota of knowledge that would be needed to practice into a students head, only a tiny handful would assimilate enough of it to be ready to start work with no need for additional training. That does not mean that the educational system is not in need of a radical overhaul. Architecture students spend way too much time in school and learn far too little that is useful to them or society. On the practical/technical/building side, I think John’s comment nailed these well and I agree with everything he said. I would add making sure that students get a stronger dose of building systems and their interactions. They get some of this stuff now, but (at least in my experience) it is handled in an offhand manner, taught by people who do not have enough experience to be teaching it, or is treated as an unfortunate requirement by both students and faculty. I remember a building systems class where the instructor read poetry. I don’t think the practical/technical/building side is where the root of the problem lies, though. I think those problems could be solved if we taught people to design better, or actually taught them to design at all. I should be clear, by design, I do not mean what things look like, but the process of solving a problem in a way that takes as many relevant factors into account as possible, and creates an effective solution that improves upon the context into which it is inserted. One thing that I have learned in my time in the trenches is that form is taste, and that if you dismiss something out of hand because it does not suit your taste, you miss opportunities to learn from it. We spend a lot of time teaching students taste and not enough teaching them how to design. 1) Equipping students to ask questions, knowing what questions to ask, and to know when they don’t know something and need to go figure out what questions to ask. In other words, intellectual curiosity. Take it from someone on the front lines of design education, it has been beat out of a lot of our students by the time they leave high school. 2) An understanding of how to find the information they need to solve a problem. Even though we are more awash in information than ever before, it seams that we are sliding backwards in our ability to take advantage of it. Me: ‘Why did you not do X?’ Student: “You did not tell me how to’ Me: ‘I don’t tell you to chew your food, but you do’ Student: ‘I could not find anything about it on the internet’ Me: Thump of head hitting desk. 3) Creating an understanding of the iterative process of problem solving, and creating a culture around that. Students need to understand that ideas do not come out whole and perfectly formed, but must be tested, shaped, and strengthened, and sometimes discarded. 4) An ability to determine objectives, understand them, and articulate them clearly. This is context independent, we could be talking about a design, solving a coordination issue, or writing a letter. 5) A deep and abiding love for humanity and all its strengths and weaknesses. Our utility to society lies in our ability to make other peoples lives better, easier, and more rewarding. If we can’t do that, and we often do not, then we deserve to go the way of the dodo and society will figure out another way to create it’s built environment in a way that is meaningful to it. Notice I did not say save the world or make people better, the idea that design can do that is bullsh*t.
This is a crappy first attempt at articulating these ideas. But I suspect that if students were taught to think about what the do in this way, it would be impossible to ignore the practical/technical/building side of things, and they would be better equipped to interface with the world than they typically are now. You will notice that there are a lot of things that I did not mention, sustainability, LEED, BIM, IPD, technology. I am not negating or ignoring any of that. I’m an ‘N’ and a ‘P’ as opposed to an ‘S’ and a ‘J’ so I’m always looking to boil things down and find the strands of glue that connect everything. Beautiful! The part about how students should be learning to be aware of knowing when they don’t know something is especially important, I think. I learned really well (in school and in my summer internships during school) that I didn’t know much. It was very clear to me that I would be learning a lot during internship after graduation. Some graduates of architecture programs don’t seem to realize that they don’t know much about how to practice. Brilliant response that resonates with me, thank you for sharing it, Richard! What would have been a better learning experience? I don’t know. In my opinion, how to teach the process of design and problem solving seems to be the crux of the whole discussion…. Thanks for your excellent input! Far from a lesser first attempt, your comment is far superior to my post – and if I could just figure out a way to make your comment the post and my post a comment – I wouldn’t hesitate to do so. If my posting regularly generated comments like this – I would post a whole lot more often. Thank you for sharing your very wise words. Your students and employees are very fortunate to have you on their side. When first heard this in school I thought it was crazy. “Hey, I can design better than those old dudes”. Now, I am one off those old dudes and after receiving multiple degrees, close to 30 years in practice (almost half that in some iteration if my own firm) I find that quote echoing in my head. Because now u finally know enough about people, design, construction, etc. to make a difference. Everything until now has been a prelude to my real career that I am embarking on. Consider it a 30 year apprenticeship. Thanks Patrick for reading the post and for the link at your site.